Shopping for an Audi is like shopping for a suit at Brooks Brothers. Audi’s top line models such as the A8 are equivalent to custom tailored Brooks Brothers dress ware in terms of price and quality. At the other end of the spectrum is their mass produced sedan, our A3 test car. Yes, it too carries the Audi name, but like a Brook Brothers “346″ Outlet Store suit, it offers less costly admittance to the store through the side door. 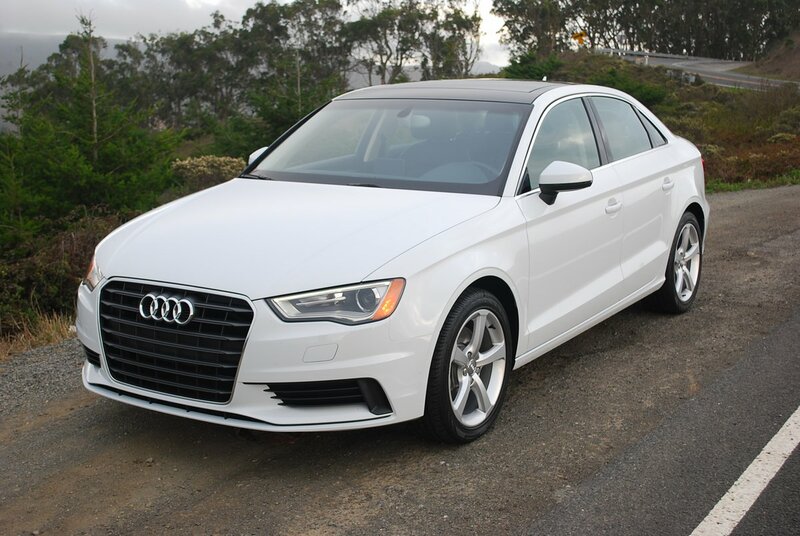 Our A3 is really Audi’s loss leader, with its base price of just $29,900. Even decked out with a smattering of extras (Glacier White Metallic paint for $550, Navigation Plus for $1,900, Cold Weather Package for $500, Aluminum Style Package for $450), this Audi slides out the dealer’s front door for just $34,195. Welcome to your back row balcony seat in the Audi/torium. Conspicuously absent from this A3′s standard fitment is Quattro, Audi’s all-wheel-drive system. The entry level model is a front-wheel-drive sedan, powered by Volkswagen’s turbocharged 1.8 liter inline 4, making 170hp and 200 lb.-ft. of torque. 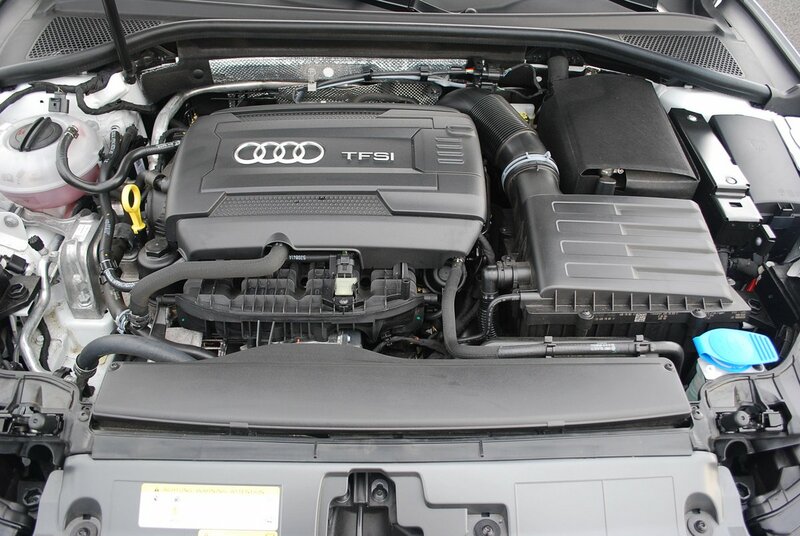 The engine drives the front wheels through an “S Tronic” 6-speed automatic gearbox. 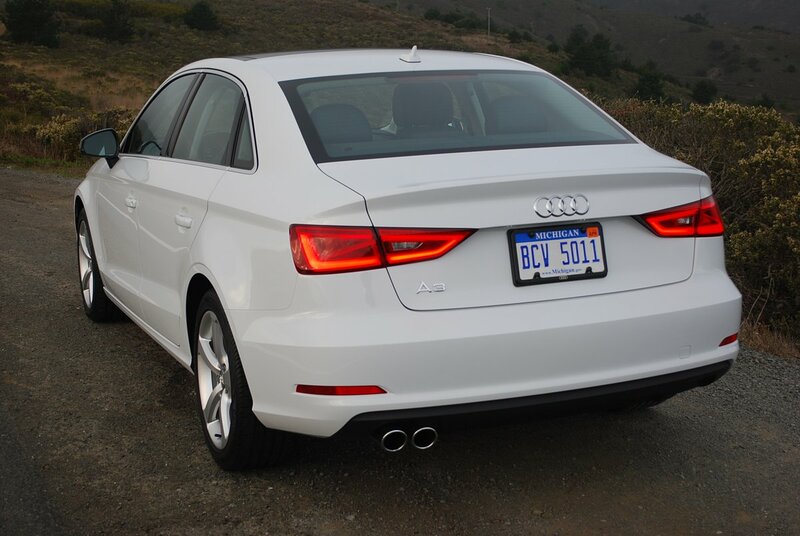 If you want Quattro you’ll need to pay $3,000 to upgrade to the 2.0 liter engine and all-wheel-drive version of the A3. If you are familiar with current VW products like the Golf, Jetta and Passat, the A3 will feel very familiar. The 1.8 liter turbo takes some judicious management via the shift lever to deliver maximum thrust. Unfortunately, you can only swap gears manually with the floor stick itself, as the steering wheel lacks paddles for shift changes. Since the A3′s suspension geometry derives largely from that of the VW Golf, handling is dependably sure footed. Even when the first rains of winter slickened the oily pavement, the A3 stuck to its line through a succession of testy curves. The Audi’s simplified 5-spoke “star design” alloy wheels mount Continental Sport Contact tires (225/45R17) at each corner. Speed sensitive electronic power steering transfers information from the front contact patches of the Continental tires to your hands with informative alacrity. You can perform some neat parlor magic tricks by inserting the ignition key into the slot of the driver’s door and holding it to the right. This will close all open windows and sunroof as well as locking the car. Turn and hold it the other way and you’ll open and unlock all windows and sunroof. The Panorama sunroof is notable for its extravagant size and nicely finished sliding interior shade panel. The front seats are definitely a grade above VW issue. Finished with leather surface, the driver’s seat offers 12 way adjustment, though fore and aft travel is curiously manual. The passenger’s seat makes do with manual adjustment for rake and slide, and both seats could do with more lateral bolster support. The rear seats fold flat in a 60/40 split. The A3 also enjoys a cavernous trunk with a sub-floor compartment for space saver spare, jack and small tool roll. The MMI navigation color display ingeniously pops out of the dash when you start the A3, and becomes the focal point for all your climate, navigation and entertainment needs. In an effort to keep the dash face free of incidental controls, Audi moved nearly all switches to the center tunnel surface between the seats. You will struggle to figure out exactly what the big knob controls without taking your eyes off the road. The system verges on dysfunctional. Relocation of the radio volume knob to the center console is particularly annoying. On the other hand, Audi has produced the very best vent controls in the car business. Each of the 4 gaping supply orifices on the dash face are encircled by knurled aluminum rings that can be twisted to admit more or less air. Absolutely brilliant engineering. The A3, which is built by Audi in Hungary, presents an affordable route to Audi ownership for the new car buyer. For this kind of money, you won’t get Audi’s trademarked Quattro system, but you will enjoy a level of build quality, sleek German Bauhaus design, and responsive performance that is hard to match for the price.